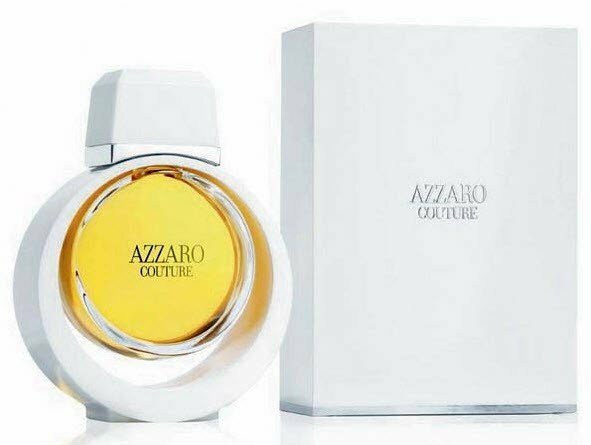 Azzaro Couture (2008) is a perfume by Azzaro / Parfums Loris Azzaro for women and was released in 2008. The scent is floral-chypre. The longevity is above-average. The production was apparently discontinued. A further advance on Chandler Burr's complimentary review on the new Couture would be redundant and a little arrogant, it really hits the mark. Yes, I often bemoan the dearth of elegant perfume releases in a plethora of saccharine concoctions. Saccharine is artificial sugar, a chemical aping of cane sugar just as the sweet monstrosities of the perfume world dull and dumb us down with the olfactory equivalent of high blood sugar. When I heard that Prada had produced 'Candy' there was a sharp intake of breath and a very long measured sigh. Small voices say 'Learn to accept the things you can't change and be grateful for small mercies,' then came Nicky Minage. Candy, all is forgiven. I had never heard of Couture, not even the older version but the new one caught my eye at a ridiculous price on a daily special. Mentally I was rockin' Austin Powers as I spied the bottle. I really liked it, in the way I liked Thunderbirds (FAB) and the suspended polycarbonate white sound shell chair of the sixties. I found a few references, Chandler's being one of them and gave it a go. I'm so pleased I did. I can believe that this perfume contains five absolutes, which is to say, I want to believe it because I like it, If you took to 'Enjoy, Bill Blass (new) Fleur de Cristal, Noa, Flora Nymphaea, First, Y (YSL) Belle en Rykiel etc then that's the general direction but they're not as good. Obviously regulations have taken their toll on these and Couture has been built from the ground up. It's a happy spring scent. a feminine scent (sorry guys, I can't see it on a man) It's compote sweet, not jammy sweet. (compote only has enough sugar to keep for a few days) and there's a sort of guava or feijoa blossom tang. I've worn this exclusively for a few days, feeling faithful, enjoying the fruit tea aspect of it at dry down. Smash hit at my place. The bottle has tiny crystals on the top to remind me of a disco ball. Austin Powers' fembots are grooving the scene. "Hey DaddyO, do I make you smell nice, baby? Oh Austin, behave....and retrieve my bottle of Couture from the fembots, I'm sure there's state secrets embedded in those little Swarovski crystals. Yes, I can see Liz Hurley as Vanessa wearing this, a top model with a comedic side, classy but fun. This is an interesting floral/fruity chypre. It is largely linear, not a common trait for a chypre, and while it is sweet, the sweetness lies in the floral notes and not the fruity notes. The rose is candied, but the fruit note, somewhere between melon and pear, is tart and sharp. There are many notes listed (rose, bergamot, mimosa, ambrette seed, galbanum, patchouli.) Somehow they create a nose-gestalt that reads as a light chypre, a floral/fruity and a spicy musk. The spiciness reads as a nicely placed pepper note reminiscent of the one in Caron’s Parfum Sacré. It lines up beautifully with the rose and the fruit. It cuts the rose’s sweetness, gives the fruit its green edge and lasts from start to finish. 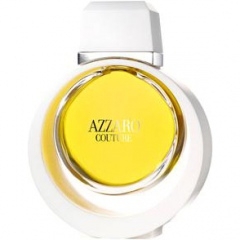 The linearity tells me that Azzaro Couture might not so much be an ‘actual’ chypre (ie. with oakmoss) as an implied or suggested chypre. Bergamot and the pepperiness give a hint of that rough bitterness that I associate with chypre. The great thing about linearity here is that it stops the clock at an accord that reminds me of the heartnotes of Diorella---almost turned fruit balanced with a dark raspiness. AC doesn’t have great projection and it lasts better on the strip than on my skin. Although linear for the most part, AC’s constituent elements (flower, fruit, musky spice) remain distinct, and even into the drydown there is no blurring of the lines. perfumes that are hard the review. Write the first Review for Azzaro Couture (2008)!